Many people find that they have plenty of different types of tools and yet, find it difficult to complete the job on hand satisfactorily because of disparity in these power tools. The Hitachi KTL718C tool kit is the best option for these people if they want to buy a comprehensive multipurpose tool kit. Those who purchase the Hitachi seven-piece tool kit will soon realize that it is worth the money spent. They need not struggle any longer with assortment of tools of varied sizes and different types of battery chargers stored in a number of boxes. Instead they will have all the essential tools in a nice Hitachi bag manufactured exclusively for the Hitachi KTL718C power tools. All the tools are in standard sizes and each tool is meant for a specific job. The user no longer has to worry about coping up with large number of tools in various sizes, makes and ages all cluttered in different boxes. The Hitachi KTL 718 C tools are cordless power tools and all the tools put together weigh only twenty-two kilograms. This makes it very comfortable to shift from one job to another. The KTL718C tools in the kit are so versatile that they can be used for wide variety of jobs like plumbing, electrical works, carpentry and maintenance jobs. The power tools in the Hitachi kit are useful for drilling, grinding, cutting and finishing works. It is comparatively cheaper to purchase the high-quality seven-piece power tool kit online rather than buying in the shops. In addition to the Hitachi tools, the kit includes three batteries for the tools. The batteries provide power to the seven tools set much longer period than any other tools in similar tool kits. Added to this, the tools these batteries power are even more amazing. The DV19 DSL hammer drill-driver provides lot of twisting or rotary force (torque). It can be adjusted in any of the three available modes such as hammer, drill and impact drill. The Hitachi KTL718C tool kit also contains an ‘impact wrench’, which can be set at different speeds. There is also a provision for a reverse setting and it will drive M14 bolts as well as screws ranging from 4 mm to 10 mm. The switch on the impact wrench facilitates the user to control forward or reverse speed with his thumb. Although the KTL718C kit contains only seven tools they are useful for different types of jobs. Those having several jobs on hand and would like to have a tool to cover every job, then the Hitachi KTL718C is the right tool kit for them. It will work out costly if someone buys these tools individually and moreover, he cannot be sure that he has the entire set of tools required for various jobs. KTL718C tools are manufactured keeping in view all the recent ‘ergonomic’ pressures. 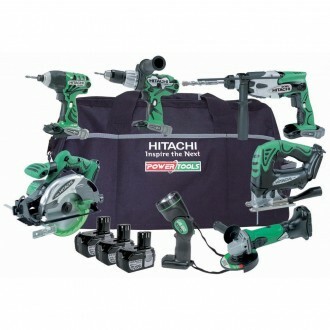 In nutshell, everyone who uses power tools regularly should buy this unique Hitachi KTL718 C seven-piece tool kit. The Leather Company is a reputed manufacturer of most of these hand tools and allied items, endeared by craftsmen for years, for their superior quality. The home owners would also require a stud finder and a wall board knife also, to attend to the work on the ceilings and the walls, in addition to the items already pointed out. Therefore, it is advisable to purchase and stock these essential implements, instead of spending too much on costly tools, anticipating future use. The homeowner has to inevitably stock the tool box with items such as hammer, utility knife, framing square, small nails, rubber mallets and such other items, if he has an idea to work on panel walls. For the work on plaster walls and floor tiles, tools requirement may vary. In order to acquire a correct combination of different tools as essentials items to be stocked, it is always ideal to consult a professional or a supplier of home improvement items.